A former criminal defense attorney and legal analyst for CNN, ESPN and USA Today for the Mike Tyson, O.J. Simpson and Kobe Bryant cases, Mark Shaw is an investigative reporter and the author of 25 books including The Poison Patriarch, Miscarriage of Justice, and Beneath the Mask of Holiness. Mr. Shaw, a member of the American Society of Journalists and Authors, has written for USA Today, Huffington Post, and the Aspen Daily News. More about Mr. Shaw, who lives in the San Francisco area, may be learned at markshawbooks.com and on Wikipedia. "The Reporter Who Knew Too Much is a very interesting, informative, and provocative book. Shaw has obviously conducted a tremendous amount of research and investigation into every aspect of Kilgallen’s life. Her relationships with so many famous, controversial individuals and legal cases are fascinating to read." 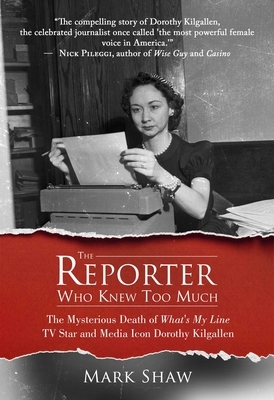 "The compelling story of Dorothy Kilgallen, the celebrated journalist once called 'the most powerful female voice in America.'" "Mark Shaw has written a gripping biography of Dorothy Kilgallen wrapped in the greatest cold case of all time, the JFK assassination. This is a real page-turner and I defy anyone to put it down once they have started it." “Mark Shaw is the real deal when it comes to investigative journalism – as was Dorothy Kilgallen – one of the most important multi-media icons of the 20th century." "Expertly written, Mark Shaw's "The Reporter Who Knew Too Much," is a riveting true-life murder mystery, thoroughly accessible to readers if all backgrounds. Reference notes and an index round out this "must-read" for true crime connoisseurs. Highly recommended!"